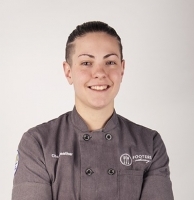 Heather Carr joined Footers in August, 2015 as the Sous Chef of our AWESOME culinary team. She graduated from the Johnson & Wales' Denver Campus in 2013 and has since worked at local favorites such as ChoLon Asian Bistro. She transitioned from restaurants to catering when she made the move to Los Angeles, CA and began working at a boutique catering company. Since moving back to Denver, Heather eagerly joined the Footers Family and has been working at "making it better every day."